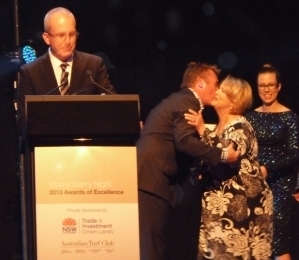 Ocean Club Resort was a participant in The Manufactured Housing Industry Association of NSW, 2013 Awards of Excellence held at the Sydney Star Casino on Thursday 1st August. Ocean Club Resort was very proud and excited to win the 2013 Best Manufactured Home Village on the night. At the awards dinner themed “Starry Starry Night”, the resort was named one of five finalists. After a sumptuous meal, and with much trepidation and nervousness, the winner was finally announced. After squeals of delight, representatives Karen and Suzanne were thrilled to walk up on stage to receive a magnificent trophy and certificate which are now on display in the sales office. Karen Twigg, our onsite manager was a finalist for the Employee of the Year award. Unfortunately she didn't win this year, but her patience, perseverance, hard work and dedication at the resort has been recognised and commended by the residents and management. Better luck next year Karen ! 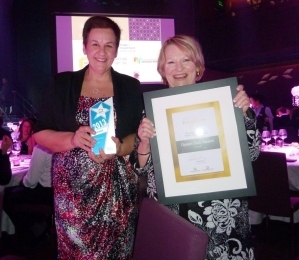 Below are a couple of photos of Karen and Suzanne grinning from ear to ear showing off the award!